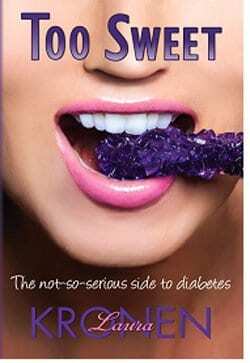 “Too Sweet, the Not-So-Serious Side to Diabetes,” a book by Laura Kronen. Highly recommended reading for a family member, friend, significant other or anyone you know who might be interested in the real life of someone who is dealing with Type 1 diabetes on a daily basis — a tough job. Gutsy book from a gutsy lady, lots of laughter, but the true facts are there. Great Christmas gift. “Too Sweet” gives you a day-to-day look at the battle that a person with Type 1 diabetes goes through. Normally, not a fun job, but Kronen puts a funny spin in the right places. If you can’t laugh about some of these situations, they will laugh at you, so you might as well get the jump on them. High glucose levels, low glucose levels; working glucose meter, malfunctioning glucose meter; blood strips trailing you around the house. It’s all in this book. You are there, you live it. A very serious condition that needs serious consideration every minute of the day. And only someone living this life can put into words what it is truly like. Kronen does an excellent job of telling us about the never-ending responsibilities of taking care of Type 1 diabetes. She’s lived it, still lives it and is doing a fine job of it. Enjoy the book. Laugh with Kronen. It might just keep that blood glucose level normal for a couple of days. Smile, be happy, use that pump or take that shot, but smile, be happy. This entry was posted in Diabetes News on September 15, 2014 by admin.